Are you searching for a prom dress with sleeves that's still a stunner? Eternity presents a diverse and exciting portfolio of modest gowns that must be seen to be fully appreciated. The online photo gallery includes taffeta ballgowns with asymmetrical drop waistlines, mock wrap iridescent cocktail dresses, satin sheath dresses, matte satin gowns with organza ruffles and many more styles. The company also offers several types of accessories, including corselets, faux fur shrugs, and an elegant beaded hijab. At the time of this writing, the company website states that dresses are not sold directly to the public. The site does contain a contact form so that you may inquire about retailers in your area. UPDATE: It appears that Eternity has now gone out of business. 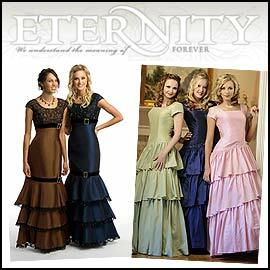 You may be able to find some used Eternity dresses on Ebay.